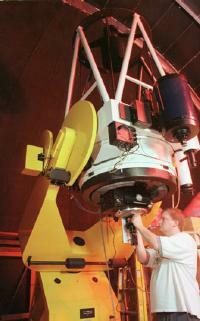 Appalachian State offers a concentration in astrophysics as an option in the physics degree program. 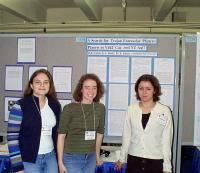 Show at left are students presenting their research at a meeting of the Americn Astronomical Society, in San Diego. We also have a graduate program in applied physics which allows a masters thesis to be done in astronomy. Shown at right is recent graduate student Chris True at the 32-inch telescope, which he used to develop a speckle interferometry camera for resolving close binary stars. Chris now works as the Physics and Astronomy Lab Manager at Charleston College in South Carolina.